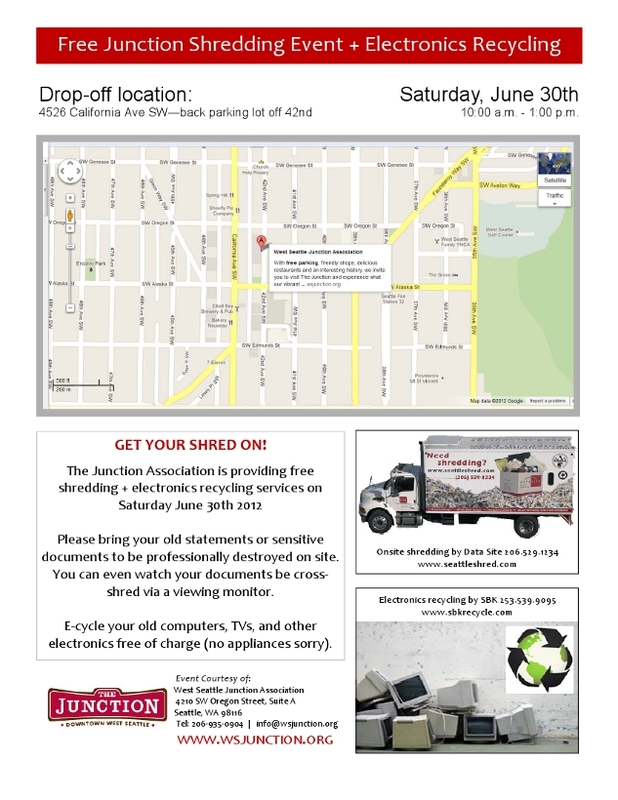 Free Junction Shredding & Recycling Event June 30th! Get your shred on, Saturday, June 30th from 10am to 1pm. Bring your old statements and sensitive documents for shredding on-site in The West Seattle Junction! You can also drop off your old computers, TVs and other electronics (sorry no appliances) for recycling! All for FREE! Drop off location is 4526 California Ave SW – back parking lot off 42nd. On Site Shredding will be provided by Data Site 206.529.1234 and Electronic Recycling by SBK 253.539.9095. Click on the photo for a full size pdf for more information and map. This event is brought to you courtesy of West Seattle Junction Association.